Тема в разделе "СКАМ", создана пользователем All-HYIPs.info, фев 25, 2019. Alula Capital организована с целью создания эффекта и повышения уровня качества инвестиционных программ в интернете. Alula Capital поддерживает высокие стандарты безопасности, стабильности и качества. Наш сайт предоставляет нашим трейдерам необходимую ликвидность и ресурсы, чтобы поддерживать объемы торговли на высоком уровне для достижения целей прибыли наших инвесторов. 26.02.19 18:48;Account;Receive;Received Payment 0.9 USD from account U12467472 to account U1294000. Batch: 248100275. Memo: API Payment. Withdraw to allhyips from AlulaCap.com. 26.02.19 09:24;Account;Receive;Received Payment 0.3 USD from account U12467472 to account U1294000. Batch: 248023250. Memo: API Payment. Withdraw to allhyips from AlulaCap.com. 27.02.19 08:40;Account;Receive;Received Payment 0.31 USD from account U12467472 to account U1294000. Batch: 248168420. Memo: API Payment. Withdraw to allhyips from AlulaCap.com. 28.02.19 09:10;Account;Receive;Received Payment 0.9 USD from account U12467472 to account U1294000. Batch: 248327092. Memo: API Payment. Withdraw to allhyips from AlulaCap.com. 01.03.19 21:36;Account;Receive;Received Payment 0.31 USD from account U12467472 to account U1294000. Batch: 248916790. Memo: API Payment. Withdraw to allhyips from AlulaCap.com. 01.03.19 08:28;Account;Receive;Received Payment 0.32 USD from account U12467472 to account U1294000. Batch: 248471656. Memo: API Payment. Withdraw to allhyips from AlulaCap.com. 01.03.19 08:28;Account;Receive;Received Payment 0.9 USD from account U12467472 to account U1294000. Batch: 248471651. Memo: API Payment. Withdraw to allhyips from AlulaCap.com. 03.03.19 19:05;Account;Receive;Received Payment 0.3 USD from account U12467472 to account U1294000. Batch: 249162714. Memo: API Payment. Withdraw to allhyips from AlulaCap.com. 02.03.19 22:55;Account;Receive;Received Payment 0.9 USD from account U12467472 to account U1294000. Batch: 249054224. Memo: API Payment. Withdraw to allhyips from AlulaCap.com. 04.03.19 16:12;Account;Receive;Received Payment 0.45 USD from account U12467472 to account U1294000. Batch: 249290581. Memo: API Payment. Withdraw to allhyips from AlulaCap.com. 04.03.19 06:54;Account;Receive;Received Payment 0.9 USD from account U12467472 to account U1294000. Batch: 249209770. Memo: API Payment. Withdraw to allhyips from AlulaCap.com. 05.03.19 08:59;Account;Receive;Received Payment 0.9 USD from account U12467472 to account U1294000. Batch: 249378665. Memo: API Payment. Withdraw to allhyips from AlulaCap.com. 07.03.19 08:49;Account;Receive;Received Payment 0.38 USD from account U12467472 to account U1294000. Batch: 249683479. Memo: API Payment. Withdraw to allhyips from AlulaCap.com. 06.03.19 15:43;Account;Receive;Received Payment 0.9 USD from account U12467472 to account U1294000. Batch: 249594372. Memo: API Payment. Withdraw to allhyips from AlulaCap.com. 09.03.19 03:15;Account;Receive;Received Payment 1.35 USD from account U12467472 to account U1294000. Batch: 249936479. Memo: API Payment. Withdraw to allhyips from AlulaCap.com. 08.03.19 05:48;Account;Receive;Received Payment 0.45 USD from account U12467472 to account U1294000. Batch: 249808130. Memo: API Payment. Withdraw to allhyips from AlulaCap.com. 07.03.19 17:21;Account;Receive;Received Payment 0.9 USD from account U12467472 to account U1294000. Batch: 249754224. Memo: API Payment. Withdraw to allhyips from AlulaCap.com. 10.03.19 10:14;Account;Receive;Received Payment 0.9 USD from account U12467472 to account U1294000. Batch: 250099632. Memo: API Payment. Withdraw to allhyips from AlulaCap.com. 11.03.19 15:45;Account;Receive;Received Payment 0.9 USD from account U12467472 to account U1294000. Batch: 250290120. Memo: API Payment. Withdraw to allhyips from AlulaCap.com. 11.03.19 07:45;Account;Receive;Received Payment 0.3 USD from account U12467472 to account U1294000. Batch: 250216812. Memo: API Payment. Withdraw to allhyips from AlulaCap.com. 12.03.19 20:08;Account;Receive;Received Payment 0.45 USD from account U12467472 to account U1294000. Batch: 250495366. Memo: API Payment. Withdraw to allhyips from AlulaCap.com. 12.03.19 17:26;Account;Receive;Received Payment 0.9 USD from account U12467472 to account U1294000. Batch: 250476932. Memo: API Payment. Withdraw to allhyips from AlulaCap.com. 12.03.19 05:52;Account;Receive;Received Payment 0.45 USD from account U12467472 to account U1294000. Batch: 250365377. Memo: API Payment. Withdraw to allhyips from AlulaCap.com. 13.03.19 20:26;Account;Receive;Received Payment 1.05 USD from account U12467472 to account U1294000. Batch: 250666515. Memo: API Payment. Withdraw to allhyips from AlulaCap.com. 15.03.19 08:10;Account;Receive;Received Payment 0.9 USD from account U12467472 to account U1294000. Batch: 250902387. Memo: API Payment. Withdraw to allhyips from AlulaCap.com. 16.03.19 12:35;Account;Receive;Received Payment 0.9 USD from account U12467472 to account U1294000. Batch: 251107947. Memo: API Payment. Withdraw to allhyips from AlulaCap.com. 17.03.19 19:13;Account;Receive;Received Payment 0.9 USD from account U12467472 to account U1294000. Batch: 251321175. Memo: API Payment. Withdraw to allhyips from AlulaCap.com. 19.03.19 08:02;Account;Receive;Received Payment 0.9 USD from account U12467472 to account U1294000. Batch: 251577615. Memo: API Payment. Withdraw to allhyips from AlulaCap.com. 20.03.19 18:33;Account;Receive;Received Payment 0.9 USD from account U12467472 to account U1294000. Batch: 251849915. Memo: API Payment. Withdraw to allhyips from AlulaCap.com. 23.03.19 06:21;Account;Receive;Received Payment 0.9 USD from account U12467472 to account U1294000. Batch: 252241215. Memo: API Payment. Withdraw to allhyips from AlulaCap.com. 22.03.19 05:48;Account;Receive;Received Payment 0.9 USD from account U12467472 to account U1294000. Batch: 252072371. Memo: API Payment. 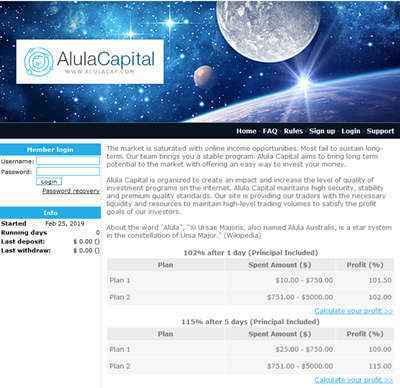 Withdraw to allhyips from AlulaCap.com.